Did you know that Supernovas are some the most powerful and spectacular events in the universe? And now we want you to be part of the biggest explosion of wins you can imagine when you play our new Nova 7s slot with a 111% Match and 33 Free Spins! 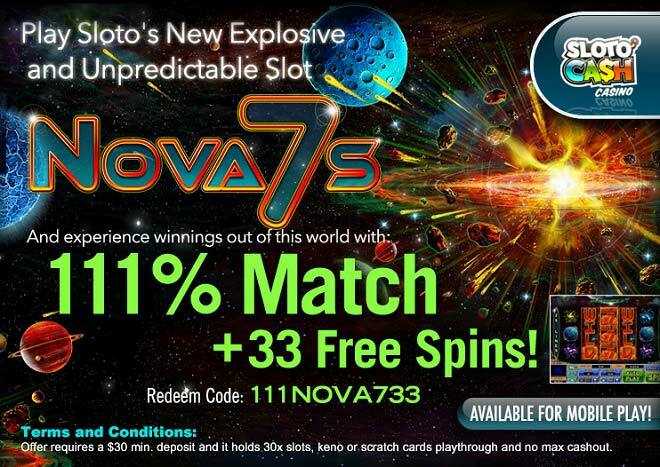 Gravitate towards wins when you spin the 25 paylines and 5 reels of Nova 7s from your desktop, mobile device or instant play version right from Sloto’s website! Land the wild Red 7 and it will replace every other symbol (except for the scatter Blue 7) to create winning combinations. More massive wins occur with the help of multipliers, free spins and the hypernova feature. Interstellar wins are about to orbit your galaxy when you make a deposit of as little as $30 and play our new Nova 7s slot with a 111% Match + 33 Free Spins!